For those worried about rising greenhouse gas emissions, geological history has an example to show what the earth looks when CO2 concentrations are cranked into overload. The Eocene epoch, some 50 million years ago, had CO2 levels that were five times today's concentrations - and temperatures that were as as much as 12°C (21°F) higher. 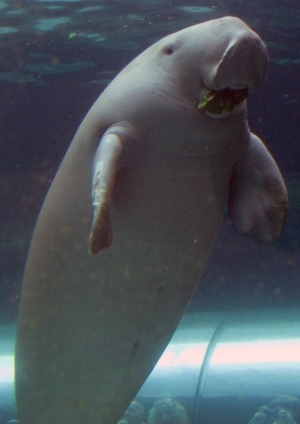 Captive dugong (Dugong dugon) at the Sydney Aquarium. But pinning down how this uber-greenhouse scenario played out with rates of rainfall has been tricky for scientists - until now. Science is today publishing a paper that looks to the teeth of ancient sea cows in order to help track how water flowed around the planet 15 million years after the dinosaurs vanished. 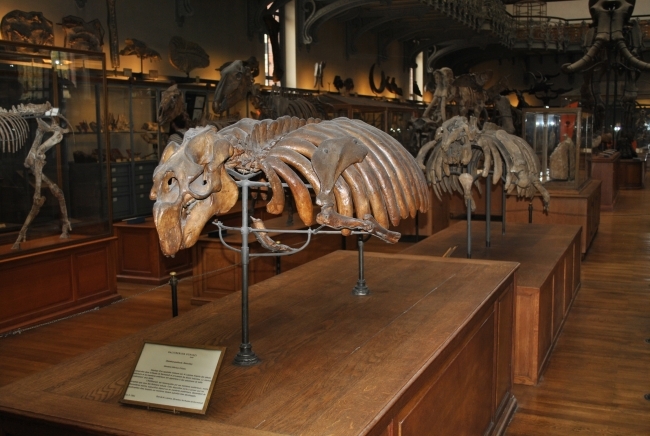 Fossil sirenian, Halitherium schinzi, at the Paris National Museum of Natural History. The Eocene is a fascinating period of the earth's past for climate scientists - a time when forests extended up to the poles, and the term 'greenhouse earth' was a fact - not a worrying future possibility. Scientists have focused plenty of attention on the brief periods of heightened warming, known as hyperthermals, which punctuate the Eocene epoch. But less is known about the water cycle across the whole of the planet during this hot and humid era. 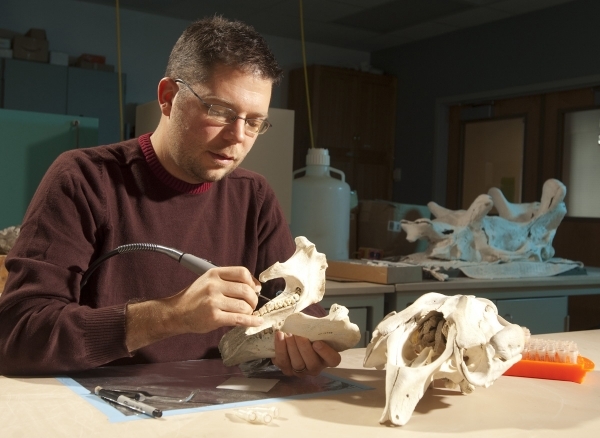 Mark Clementz, Assistant Professor in the Department of Geology and Geophysics at the University of Wyoming, sampling tooth enamel from molars in the lower jaw of a Florida manatee (Trichechus manatus latriostris). One solution for working out rates of rainfall is to study oxygen isotopes from sea-water. When there is a greater influx of freshwater into the sea, due to heavier rains, then less of the heavier oxygen isotope is found. But temperature can also affect these isotopes. So a great place to sample them is in the teeth of sea mammals. That's because mammals maintain their body's at a level temperature, and so the isotope record isn't influenced by changes in sea temperature. 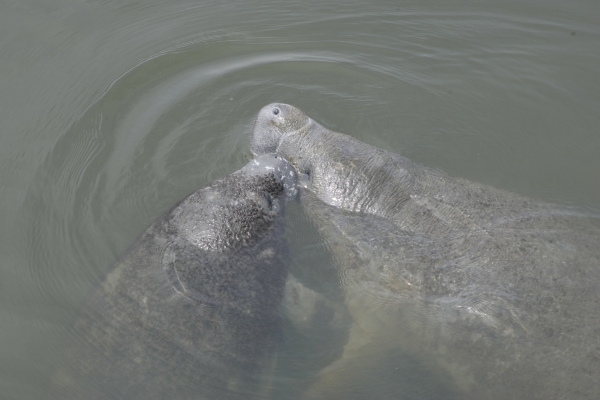 Two Florida manatees (Trichechus manatus latirostris) from the Indian River Lagoon, Florida. So the scientists from the University of Wyoming, and Kutztown University in Pennsylvania, have turned to the ancient equivalents of sea cows - dugong and manatees - to help better describe the Eocene hydrological cycle. And the results show that oxygen isotopes in the sea were depressed at lower latitudes - in zones nearer to the equator. The pair of scientists interpret this as confirming that a vigorous water cycle extended across the globe. 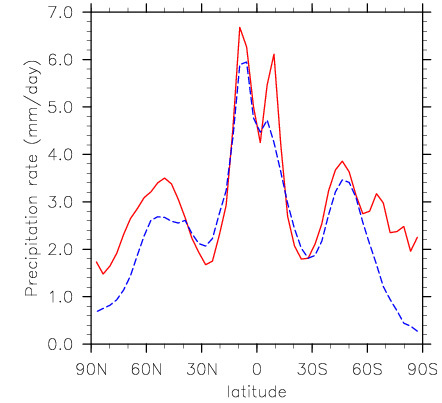 Zonally averaged annual precipitation for the Eocene (red) and Modern (blue dashed) showing enhanced precipitation in the tropics, as well as the mid-high latitudes. It was already known from previous studies that levels of water cycling nearer the poles, during the Eocene, was quite high. But the results from the sea cow tooth enamel shows there were even more abundant outflows of water nearer the tropics. The team confirmed these findings by running an climate model for the Eocene, which also had high levels of precipitation around the tropics. So the Eocene wasn't just a hot greenhouse - it was also a very steamy one, right across the planet. 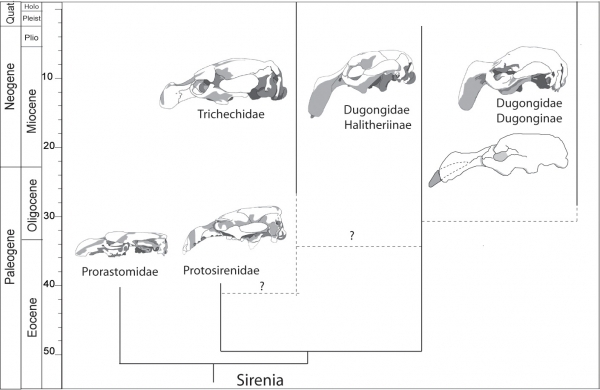 Phylogeny of fossil sirenians. Skulls represent typical members of each family listed. Dashed lines and question marks denote questionable relationships between trichechids (i.e. manatees)and other sirenians.